Spinning Spines is the temple level of Sea Breeze Cove in Donkey Kong Country: Tropical Freeze, and the fourth Hidden Kong Temple level in the game. In the level, the Kongs make use of small platforms carried along massive, carousel-like structures, allowing them to traverse pits or use them as steps to reach higher areas. However, the platforms are usually driven into spiked obstacles, forcing the Kongs to jump off them in time to avoid getting injured. These obstacles include spinning cylinders, flanking the sides of the carousel structures. Another common obstacle found in the level are the spinning skewers armed with pairs of sharp blades around them. Past a Tucks at the start, the Kongs come across small platforms moving along a massive spinning structure, which carry them across a pit bounded by spiked cylinders. Soon after, the Kongs would have to avoid a Hootz and a bladed skewer, after which they find another carousel of platforms leading up to a Tucks. Beyond, a pit soared by two Hootzes and a Tuffton gapes towards a series of carousels, which the Kongs would have to navigate while avoiding spiked rotating columns and bladed shafts threatening to pounce them. The floor beyond is patrolled by a Fish Poker Pops and ends with a short system of Barrel Cannons floating in an abyssmal area. Beyond a few skewers and two crushing rollers the Kongs would have to avoid while being fired from barrel to barrel, they return on solid ground to encounter a stacked carousel leading through an upward passage, walled with spiked surfaces. As they jump from one moving platform to another while avoiding wall spikes and a few Buzzies, the Kongs eventually reach two skull Barrel Cannons blasting them through the interior of the carousel. The camera shifts above the spinning carousel to capture the Kongs as they are launched on a platform floating right in the middle of a lava lake located underneath. 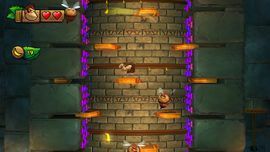 As the platform starts to sink in the surrounding lava, the Kongs would have to quickly jump several other sinking platforms, avoiding a darting skewer. A sinking carousel structure follows, leading the Kongs into a section where they would have to navigate rows of moving skewers, Hootzes, and sinking platforms to reach a section where lava starts to rise. Making their way through another carousel passage, the Kongs are soon led by cannons out of it, entering a chamber at the top, where the Mysterious Relic is held. Donkey Kong is about to collect the third Puzzle Piece. Inside the Purple Glass Vase where the Fish Poker Pops is. It can be destroyed by pounding the ground next to it. Entering the area surrounded by Buzzies, players will notice a Puzzle Piece above a pit in the middle, which can be obtained with a roll jump. At the top-left of the first rotating carousel encountered in the lava-filled area. It becomes more noticeable as the carousel structure sinks into the lava. Near a row of Hootzes flying above lava, before the last carousel segment. Once entered, a Barrel Cannon located above the rising lava will start aiming towards two banana bunches and a Puzzle Piece. The Kongs have to wait for the barrel to point at the Puzzle Piece and fire themselves to obtain it. Donkey Kong aims to launch himself from a skull Barrel Cannon between two crushing rollers. About to get shot into the area filled with lava. This page was last edited on April 15, 2019, at 12:40.